It was a tense moment on Friday morning, April 2. The Global Hawk was poised on the end of the runway, with the crew chief behind it in a pick-up truck (“the trapper” is the runway-based eyes and ears for the crew in the control room). Pilots, managers, and scientists sat in the darkened Global Hawk Operations Center (GHOC), intently staring at their computer screens and the LCD monitors. At 6:56 AM Pacific, the pilots commanded the takeoff from their computer and we watched the Global Hawk begin to accelerate down the runway. We listened over our head-sets as the trapper followed the jet and called out it’s speed. We watched the screen as the plane gently lifted off the runway and soared towards the stratosphere. As the Global Hawk lifted off, the scientists in the GHOC’s payload operations room broke into applause. Why did we applaud? Two reasons. First, everyone was happy that we were flying after three weeks of hard work installing our instruments and solving a myriad of hardware and software problems. Second, and more importantly, it was applause for the engineers, managers, and crew of the Global Hawk. Chris Naftel and his Dryden team have made the Global Hawk a reality for science. 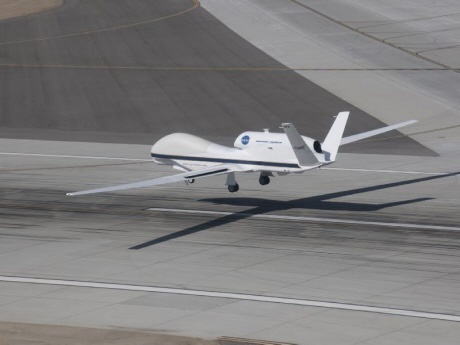 This was an historic occasion — the first test flight of the Global Hawk carrying a science payload. This flight ushers in a new era that combines state-of-the-art aircraft hardware and science instruments with software — a hybrid of satellites and aircraft for future science. I imagine that in the future there will be fleets of these aircraft probing our atmosphere and providing information for weather forecasting, hurricane reconnaissance, ozone depletion, and climate change. Do these guys know they’re being filmed? One of the instruments being flown on the Global Hawk is the Airborne Compact Atmospheric Mapper. ACAM is about the size of a microwave oven, and it is mounted in the bottom of the tail of the Global Hawk. ACAM has two parts: a spectrometer and a high-definition video camera. We all know about cameras, but what is a spectrometer? It is used to measure light at hundreds of wavelengths (both visible and invisible). Sunlight is composed of many colors that combine to form white light, and each of these colors has a specific wavelength. For example, red has a wavelength of about 650 nanometers (or 650 billionths of a meter), green is about 510 nanometers, and blue is about 475 nanometers. Digital camera images combine the red, green, and blue wavelengths to create photos. nanometers, and can resolve light differences of about 1 nanometer. So what good is that? Well, certain gases absorb certain wavelengths of light, but not others. For example, ozone absorbs very strongly 310 nanometers, but much less at 330 nanometers. This difference allows us to measure how much ozone is below the Global Hawk as we fly along. Hence, we use ACAM to measure things such as pollution and dust in the lower atmosphere. I also mentioned that ACAM has an HD video camera. The ACAM principal investigator, Scott Janz, pulled the instrument out of the plane’s tail, turned it on its side, and pointed the instrument at the Global Hawk on Thursday morning. He added a little music to show all of the detailed work that is involved in our instrument integration. Of course, he also added me doing a bit of a dance in the video. As you can tell, the coffee on Thursday was over-caffeinated. We’re making tremendous progress on installation of the instruments onto the Global Hawk, and we’re almost done cleaning up the myriad of issues. During the integration this week, we’ve had to cut holes into the aircraft. I told Chris Naftel, the Global Hawk program manager, that we had to cut some holes into the plane for the Meteorological Measurement System (MMS). Chris replied: “I don’t want to hear anything about the holes. It pains me!” In spite of Chris’ pain, the little MMS holes are critical for measuring winds. You’re now asking, what? Little holes? For winds? What kind of smoke and mirrors is that measurement? It’s actually a very slick little measurement that relies on the work of Daniel Bernoulli, a Dutch mathematician who lived in the 1700s. Bernoulli recognized that a wind difference between two holes would create a pressure difference. If you measure the pressure difference, than you’re measuring the wind difference. You can use a global positioning system card (just like the one in your car’s GPS) to measure the speed and direction of the plane. The difference between the speed of the air flowing over the nose of the plane and the plane’s ground speed will tell you the wind speed. Thank you Dr. Bernoulli! Thaopaul (Paul) Bui of NASA’s Ames Research Center has designed the MMS to measure these small wind differences using the little holes drilled around the nose of the Global Hawk. The picture shows Paul pointing to one of his little holes. There are a total of five to allow him to get the North-South, East-West, and up-down winds. Sorry Chris, but no pain, no “science” gain. NOAA is playing a big role in the GloPac mission. My co-project scientist is Dr. David Fahey of NOAA; he was recently featured in The Washington Post. One of our pilots is Commander Phil Hall of the NOAA Corps. Ozone is a crucial gas in our atmosphere because it absorbs harmful solar ultraviolet radiation. Excessive UV can lead to skin cancer and other health problems. Ozone is also a greenhouse gas, and ozone depletion in the stratosphere actually cools the Earth’s surface. The ozone instrument works by taking a stream of air from outside the plane and passing it into the body of the instrument. The air flows between a lamp that emits ultraviolet radiation and a UV detector. Because ozone strongly absorbs UV, if there is more ozone in the air, then there is less UV at the detector. If there is less ozone in the air stream, then more UV is detected. Nice, elegant, and simple in principle, but actually quite hard in practice. The first photograph shows Laurel doing a bench test of the ozone instrument on Monday morning. 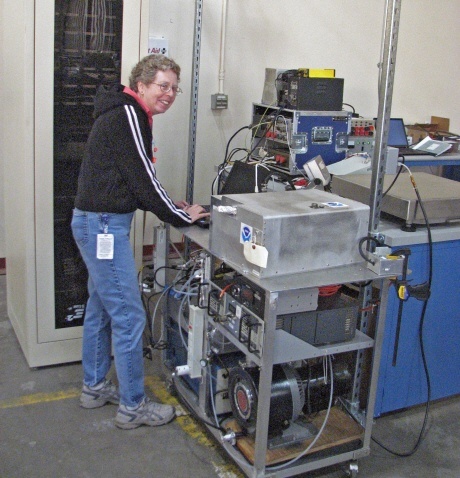 The instrument is the big silver box with NOAA stickers, sitting on the cart loaded with electronics. 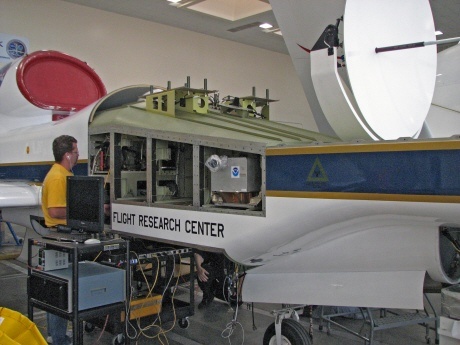 The second photograph shows the ozone instrument installed into the side bay (or zone) of the Global Hawk. All that needs to be done now is to attach the hatch with the inlet for the air stream. Again, not a simple task (see my note on patience from a few days ago). 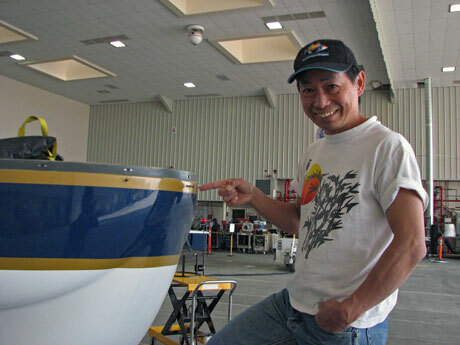 Dennis Pitts is on the left, working on some Global Hawks wiring. Dennis is one the Dryden Flight Research Facility’s avionics technicians and an operator for the Global Hawk Operations Center. Dave Fahey and I owe him a big thanks for getting us a tour of the NASA 747 that carries the space shuttle between Dryden and the Kennedy Space Center! “patience is the greatest virtue.” When it comes to mounting science instruments on an aircraft, you need to continually return to that quote. We have 10 science instruments that we will be flying on the Global Hawk (GH). The instrument integration began as far back as 2007, with discussions between the GH operations team and the scientists. The engineers and technicians first needed to know everything about the instruments: dimensions, weights, power usage, inlets or port location, etc. Slots for instruments were chosen, and detailed drawings of the Global Hawk and instruments were swapped between engineers and scientists. 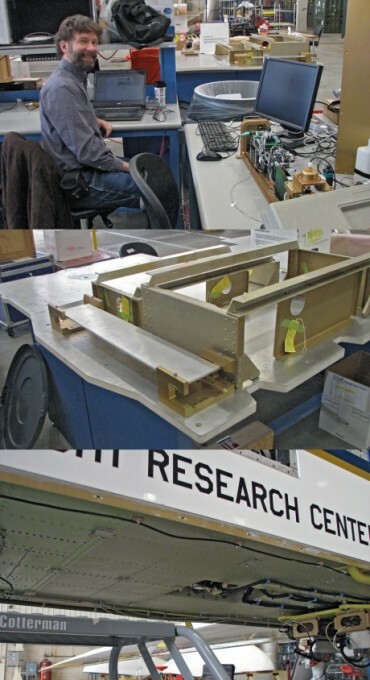 After a lot of work on technical drawings, the Dryden team began to fabricate the pallets, plates, and brackets needed to attach the instruments to the plane. When we got here last week, each instrument was placed on a bench for an electrical test and a communications test (more about this later this week). In the 1st panel of the picture below you can see David Thomson of Droplet Measurement Technologies with the Ultra-High Sensitivity Aerosol Spectrometer (the electronics jumble in front of the computer monitor). UHSAS measures very small aerosol particles — so small that a million lined up end-to-end would only be several inches long. In the 2nd photo, you see a mounting frame sitting on a big table-like plate. UHSAS will mount on top of this “long table” which is fixed onto the plate. After attaching UHSAS and a few other instruments, this plate will be flipped over and attached to the underside of the plane (panel 3). Then we need to run cables to connect UHSAS to the GH’s computers and power. All of the engineering, machining, electrical work, cable running, and testing takes time. Obviously we want the best science observations, but safety comes first. We’re making progress on integrating our science instruments into the plan, but…see the first sentence of today’s post.